A glance at its unique location within the city makes it clear that on building section A1 of the billion-euro Stuttgart 21 station conversion project only a strong architectural symbol would be able to hold its own against the giant office and shopping complex mushrooming in its direct vicinity. As the focal point of a nascent district, this cuboid building housing the new municipal library is faced with the particular task of acting as a culturally magnet. one of the landmarks of the capital of the state of Baden-Württemberg, one that is visible from a long way off. In this design it is inner values that count: admittedly, the uniform grid-like façade made of concrete and glass blocks makes the building seem hermetic and introverted but on the inside an impressive variety of rooms opens itself up to the visitor. The central area belonging to the municipal library is made up of three main rooms with asymmetrical axis: the “forum” on the lowest story, a cubic room designated the “heart” on the entrance level and the reading room which rises up in the shape of an inverted stepped pyramid from the fifth right up to the ninth floor. These three elements represent the basic idea behind modern library architecture – information, contemplation and communication. Grouped around the central rooms is functional space and access areas, in turn, surrounded by a ring of work and communications zones. In the all-round galleries at inner façade level the concentric arrangement of functions comes to an end in design terms. 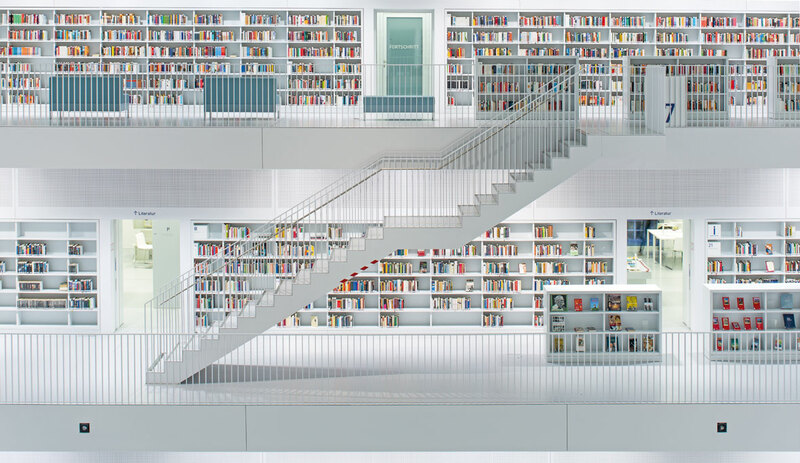 These galleries allow all library users to cast the occasional glance at their ever-changing surroundings and to follow a new urban district as it arises. At the same time, this view offers a charming contrast to the monochrome interior decorations. The lively colors of the book spines are the only element that breaks up this interior’s gray and blue tones. 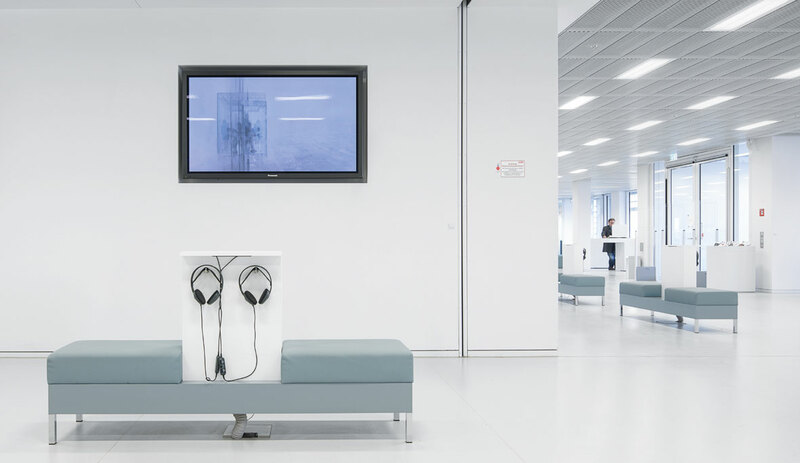 A highly effective combination which highlights the particular social value of books as a physical information medium, even in the face of the 200 computer-assisted workstations. What this new usage concept aims at – communicating knowledge actively and not hiding it behind high walls – becomes particularly apparent at nighttime. What this new usage concept aims at – communicating knowledge actively and not hiding it behind high walls – becomes particularly apparent at nighttime. 600 lights flushmounted on the façade bathe the library in glowing blue light, transforming it into one of the landmarks of the capital of the state of Baden-Württemberg, one that is visible from a long way off. 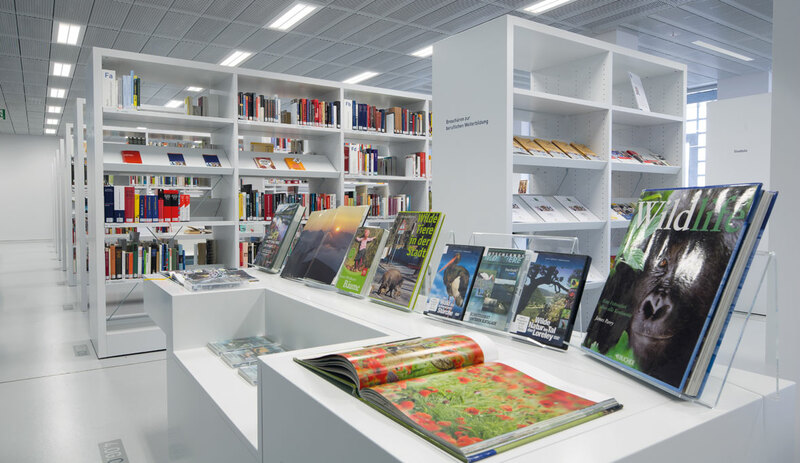 And because the lighting in the interior of the library also plays a special role, the architects, the engineers responsible for lighting planning and the specialists at TRILUX worked together from the very beginning of planning. The results are impressive: 3912 RWV, a special luminaire, allows users of the municipal library to concentrate on their work for hours on end because of these nights which are sufficiently bright without being glaring. At the heart of the lighting concept is the digital addressable lighting interface (DALI). This standardized digital interface make sure that optimum lighting is available everywhere and at all times.